There’s nothing like watching an enormous robot take its first baby-steps. 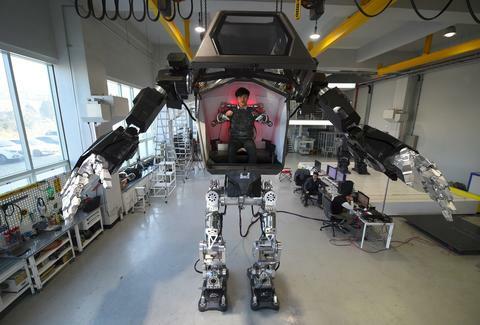 What you’re looking at here is a piloted mech, made by South Korean robotics manufacturer Hankook Mirae Technology. Called Method-2, the Optimus Prime-looking robot debuted last December, weighing 1.3 tons and standing at 13-feet. "Our robot is the world's first manned bipedal robot and is built to work in extreme hazardous areas where humans cannot go (unprotected)," Hankook Mirae Technology’s chairman, Yang Jin-Ho, said in a statement when the mech was first unveiled. According to Engadget, Yang invested over $200 million in the project, and has been working with Bulgarov -- a Hollywood SFX specialist with credits in films like Transformers, Terminator and Robocop -- since 2014 to bring the massive undertaking to life. Right now, the robot is still wobbly on its feet -- hence the comparison to its first “baby-steps” -- and is tethered by a power cable to keep it on balance, according to PhysOrg. The immediate goal though, according to Bulgarov, is to develop a mounted platform that would enable the mech to maneuver through uneven terrain without a tether. This application could also supply extra battery life in areas with limited access to a power-source. Although it looks ready for business, you won’t be seeing the Method-2 lumbering down the street, or responding to natural disasters anytime soon. But, if Yang has is way, the robot will hit the market by the end of this year, sporting an $8 million price tag.